For generators, the program automatically assigns the names GEN-1, GEN-2, GEN-3, and so on. The bus to which the generator connects, which must already exist on the one-line. You must be careful that the To Bus has approximately the same base kV as the generator. For your reference, the To Bus base kV is displayed next to the bus name. For wye-grounded connections, you can attach CTs or relays to the ground as shown in the figure below. Rated kV Generator rated kV. Rating Rated apparent power for the generator in MVA or kVA units. Generator type. This value is for reference only except for HG and SYN-SP types, which have their momentary reactances determined by X’dv. Power Factor Generator operating power factor. This value is for reference only and does not affect analysis. Efficiency Generator operating efficiency. This value is for reference only and does not affect analysis. Revolutions per minute of the machine. This value is for reference only and does not affect analysis. By default, ANSI uses 3600 and IEC uses 3000, unless the default equipment settings for generators are set to use a different value. GSU Transformer This field is available only when you configure your system to IEC short circuit. If the generator has a unit substation, then the ID name of the unit transformer is specified in this field. This association is required in order to implement the impedance correction on the generation station unit (GSU) or power station unit (PSU). Rated kV Name plate rated voltage in kV. kW Name plate (rated) power in kW. RPM Rated speed in revolutions per minute. Efficiency Efficiency in per unit. R (armature) Internal resistance of the DC generator in ohms. Generator bus type used in modeling the power flow simulation. When you select a particular model, those fields that do not apply become unavailable. PV - Constant power, constant voltage generator. This is also known as a regulated generator. This model tries to hold a user-specified bus voltage within generator MVAR limits. PQG - Constant power, constant var generator. This is also known as an unregulated generator. This model holds the MVAR generation within given voltage limits. Ctl kV PU Desired control voltage for a regulated generator (PV). The generator will try to control the voltage at the controlled bus to a given value. If the generator bus is the swing bus, this voltage serves as the reference voltage. The voltage is entered in per-unit. Ctl Angle Controlled angle is used only when a generator is designated as a swing bus. The value is entered in degrees. For a PV generator (regulated), the bus that is to be controlled to the control voltage. If this field is blank in the database, EasyPower fills it in with the name of the bus listed in the To Bus field. (Note that this does not take effect until you accept it by clicking OK to close the database dialog box.) This field is ignored if the Model is set to Swing. MW Generator output MW. This may be actual operating or a rated value. This applies only to a PV or PQG generator. MVAR Generator output MVAR. This is only used when the generator is a constant power, constant var (PQG) machine or when a PV generator MVAR limit has been reached and the machine automatically switches to PQG. MVAR Limits Minimum and maximum MVAR limits for regulated generators (PV). The generator will switch to type PQG if these limits are violated. If there is only one swing generator (Model = “Swing”) on a bus, it should not have any MVAR limits. If there are more than one swing generators on a bus, at least one of them must be unlimited. Swing (Regulated): The voltage is controlled directly on the terminal of the generator. A regulated DC generator has the ability to be the single source that enables a system to enter power flow and solve the system. Swing (Un-Regulated): The voltage is held constant internally as a Thevenin source. The terminal of the generator changes with loading. An un-regulated DC generator has the ability to be the single source that enables a system to enter power flow and solve the system. Constant Power: The generator is modeled as a constant power generator, similar to a PQ generator in the AC power flow. A constant power DC generator DOES NOT have the ability to be the single source that enables a system to enter power flow and solve the system. To enter power flow focus, at least one other source must be modeled that supplies the system with stiff internal or external source. This is the scheduled per-unit voltage that the voltage control unit will try to maintain for the generator. This applies only to the Swing (Regulated) model. This is the scheduled output kW value that the generator will deliver to the system. This is applicable only to Constant Power. Subtransient reactance in percent on generators MVA base. Most synchronous generators have subtransient reactances in the 9-20% range1. The subtransient reactance is used for ½ cycle, 5 cycle and 30 cycle short circuit calculations in accordance with ANSI Standards. 1 Short Circuit Calculations, General Electric , GET 3550. X’dv Transient reactance in percent on generators MVA base. This value typically ranges from 15-30%. The transient reactance is not used in ANSI standard calculations except for hydro and salient pole generators without amortisseur windings (Xpu = 0.75X’). X0v Zero sequence reactance in percent on generators MVA base. This value may range from 3-15% for typical generators. Zero sequence values are used in all ground fault calculations. Xlr Locked rotor impedance for induction machines. When actual data is not available, use 16.7%. Generator neutral ground resistance in ohms. This is the most common method of grounding generator neutrals and is usually given in amperes. The impedance is found from the following equation. If the generator is grounded through a grounding transformer with a secondary resistance, this resistance must be converted to the primary winding. If you know the Amp value for the resistor, you can enter the amp value in the Amp Class field and use the Calculate button to find the resistance. jX Generator neutral ground reactance in ohms. Amp Class This is the current in amps through the ground impedance at the rated voltage. You can enter data in this field directly in Amps or calculate it based on the voltage and ground impedance R +jX using the Calculate button. These options are enabled if you have selected the Show fields and X/R calculations based on IEC 60909 option in Tools > Options > Equipment. RG (Ohms) Resistance of the synchronous machine. pG Range of generator voltage regulation. RGf / X”d Ratio of fictitious resistance of the synchronous machine when calculating peak short circuit current and the sub-transient reactance (direct axis). 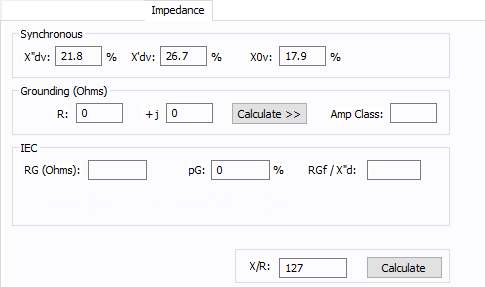 X/R Generator reactance to resistance ratio, which is used to determine resistance values in short circuit studies. Typical range is 30-150 for most generators greater than 10 MVA. Calculate Fills in a representative computed value for the X/R field. You can override this value by typing in a different number. You can plot short circuit decrement curves “with” and “without” excitation field forcing for comparison purposes. Without Field Forcing: Plots TCC for “without field forcing” option. With Field Forcing: Plots TCC for “with field forcing” option. Maximum Plot Time: The amount of time in seconds that the generator can sustain overcurrents without exceeding safe temperature limits. Xd Synchronous reactance of the generator, expressed as a percent. T”d Direct axis sub-transient short circuit time constant. T’d Direct axis transient short circuit time constant in seconds. Armature time constant in seconds. A typical generator datasheet will provide the Ta value. However, some manufacturers may not provide Ta in the datasheet. The armature time constant is associated with the rate of change of dc current in the stator when the generator is subjected to a 3-phase fault. Ta for different types of generators is provided in the book “Power System Control and Stability,” by Paul M. Anderson and A. A. Fouad, IEEE Press, 1994. Where Ld’ is the d axis transient inductance and Lq is q axis inductance. A typical value of Ta is 0.15 seconds for fault on the machine terminal. Typical value for Ta lies between 0.03 and 0.35s. Forced excitation current at a given load expressed as per unit value of field current at no load, Ifd0. This section allows you to plot “I^2t” thermal damage curve for the generator. Plot Thermal Damage Curve Select this check box to enable plotting of the damage curve and to enter data for this section. I2t Value This defines the (I^2)t line for the damage curve. I is in per-unit of generator rated current and t is in seconds. If I2t Value is 20, then the extrapolated damage curve line would intersect with the FLA of the generator at 20 seconds. Plot From/To The damage curve is drawn on the TCC plot within these values as the lower and upper limits in seconds. Enable Generator Model Select the check box to enter stability information. Model Equipment models available from the selected equipment type. If the desired model is not listed, you can add it to the library. Lib Populates the table with equipment data from the library. See EasyPower Device Library for more information. 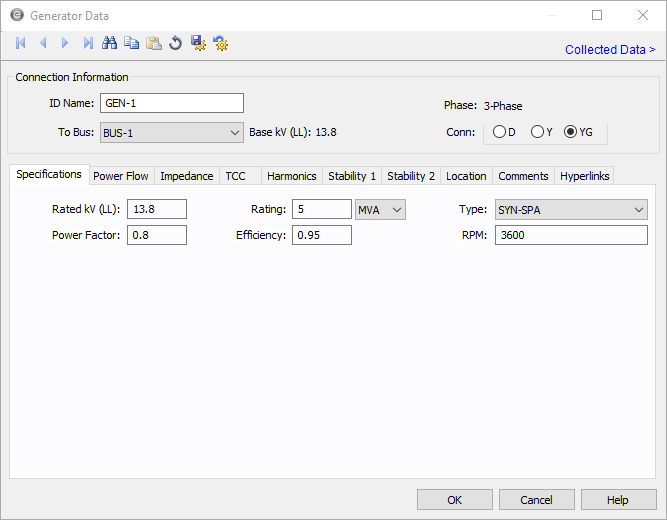 Enable Exciter Model Select the check box to enter stability information. Enable Governor Model Select the check box to enter stability information. For details on the parameters, see Dynamic Stability . For information about the library, see EasyPower Device Library. Enable Stabilizer Model Select the check box to enter stability information.